Before IBM went by that name, the company was called the Computing-Tabulating-Recording Company (CTR). CTR was formed in 1911 as a merger of four companies : Tabulating Machine Company, International Time Recording Company, Computing Scale Company of America and the Bundy Manufacturing Company. These companies manufactured a wide range of products, including employee time-keeping systems, weighing scales, automatic meat slicers, and punch-card tabulating machines. The latter category allowed the assembly of data and preparation of statistics in the era before computers. It turned IBM into the multinational that we know today. Thomas J. Watson, formerly a salesman from the National Cash Register Company, joined CTR in 1914 as General Manager. 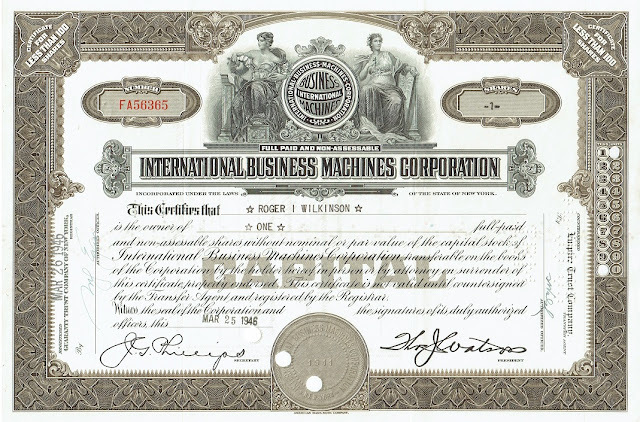 When he became CEO in 1924 Watson changed the company's name into International Business Machines. Thomas J. Watson decided to give the company its new name in February 1924. The certificate was printed with the original company name, "Computing-Tabulating-Recording Co"
but afterwards it was relabeled with IBM's current name on a silver overprint. 1944 IBM delivers the Automatic Sequence Controlled Calculator (ASCC), also called Harvard Mark I, to Harvard University. This general purpose electromechanical computer was developed with Howard Aiken. The machine read its instructions from punched paper tape. Computing pioneers Richard Milton Bloch, Robert Campbell, and Grace Hopper were among the first programmers of the Mark I. 1944 The company starts building the Selective Sequence Electronic Calculator (SSEC), an electromechanical computer. The SSEC was capable of executing instructions from paper tape or storing a limited set of instructions into its a small relay memory and executing them. 1948 The IBM 604 Electronic Calculating Punch was hundreds of times faster than any of IBM's earlier electromechanical machines. It was the first IBM product to use modular vacuum-tube based pluggable units. The 604 was programmable via plugboard and could execute a program of up to about 60 steps. 1949 The Card Programmed Calculator combined the IBM 604 calculator with the IBM 402 Electronic Accounting Machine and an external relay memory. The CPC could run larger programs by having them stored on punched cards; hence the name. It was possible to store 10 instructions in memory and execute them repeatedly in a loop. Instruction fields on the card referred to a "microprogram" on the 604 plugboard. the facsimile signature of Thomas J. Watson as President. resembled a globe, girdled by the word "International." 1952 The IBM 701 Defense Calculator was the company's first large-scale electronic computer manufactured in quantity. It was also the first IBM machine in which programs were stored in an internal, addressable, electronic memory. The 701's vacuum tubes were collected into "pluggable units" which simplified troubleshooting and service of machines. Electrostatic storage units held 72 cathode-ray tubes, sufficient to provide 2048 36-bit words. 1953 IBM launches the 650 Magnetic Drum Computer. It was initially programmed in machine language, then in SOAP, and later in FORTRAN. 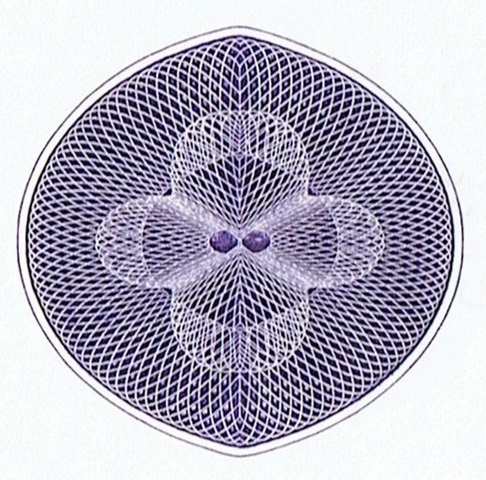 Data and instructions were stored in the form of magnetized spots on the surface of a drum. The drum memory could hold 20,000 digits at 2,000 separate "addresses". The IBM 650 became the most popular computer of the 1950s. 1954 The Naval Ordnance Research Calculator (NORC) - considered as the first supercomputer - was delivered to the U.S. Navy. It executed 15,000 calculations a second. Numbers stored in NORC's memory could be recalled in eight-millionths of a second. The machine included an input-output channel which synchronized the flow of data into and out of the computer while computation was in progress, relieving the central processor of that task. 1954 The IBM 704 Data Processing System was designed for engineering and scientific calculations and was the first mass-produced computer with floating point arithmetic hardware. The principal feature was its high-speed magnetic core storage or memory. This replaced the cathode ray tube storage used in earlier machine systems. 1955 The company announces the IBM 608 Transistor Calculator. Work on this computer started in 1954. It was a plugboard-programmable unit, and IBM's first product to use transistor circuits. More than 3,000 germanium transistors were used. 1955 The first prototype of the AN/FSQ-7 Combat Direction Central is delivered. This command and control system for Cold War ground-controlled interception used in the USAF Semi-Automatic Ground Environment (SAGE) air defense network is the largest computer ever built. Each of the 24 later installed machines weighed 250 tons and had a pair of AN/FSQ-7 computers to provide fault tolerance. One AN/FSQ-7 used a total of 60,000 vacuum tubes and up to 3 megawatts of electricity, performing about 75,000 instructions per second for networking regional radars. The AN/FSQ-7 was one of the first computers that could generate text and vector graphics on a display screen. It had the ability to directly enter commands via a typewriter-style keyboard, and also to select or draw items directly on the display using a light pen. Further, it used a modem, developed by AT&T's Bell Labs research division, to communicate over a phone line and therefore could stay in contact with other segments of the air defense network. 1956 The IBM 305 RAMAC was the first commercial computer that used a moving-head hard disk drive for secondary (magnetic) storage. The RAMAC (Random Access Method of Accounting and Control) disk storage unit measured around 1.5 square metres (16 sq ft) and stored 5 million alphanumeric characters. Real-time transaction processing became possible. 1957 IBM introduces the IBM 610 Auto-Point Computer aka Personal Automatic Computer. This vacuum tube computer fits in an office and is the first personal computer, in the sense that it is intended for use by one person (in an office) and controlled from a keyboard. The term "auto-point" referred to the ability to automatically adjust the decimal point in floating-point arithmetic. 1958 Herman Goldstine, one of the developers of the ENIAC, becomes the founding director of the Mathematical Sciences Department at IBM's Watson Research Center in Yorktown Heights, New York. 1959 IBM introduces the 1401 general-purpose mainframe computer based on transistors instead of vacuum-tubes. Five years laters, about half of the computers in the world were IBM 1401s. In May 1956, shortly before Thomas Watson dies, Thomas Watson Jr. succeeds his father. He strongly believed in the future of digital electronic computers. 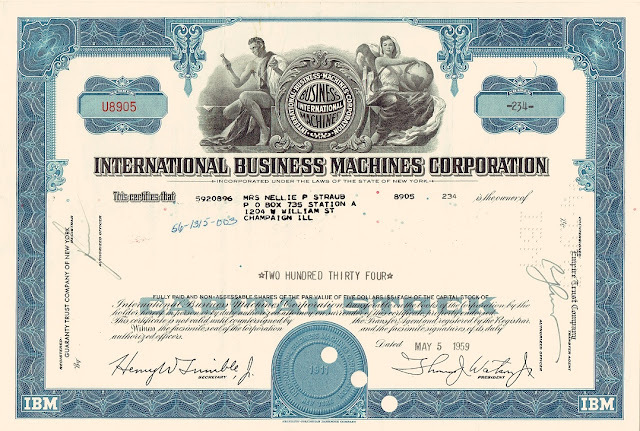 This IBM stock certificate was issued on May 5 1959 and shows the facsimile signature of Thomas John Watson Jr. as President. 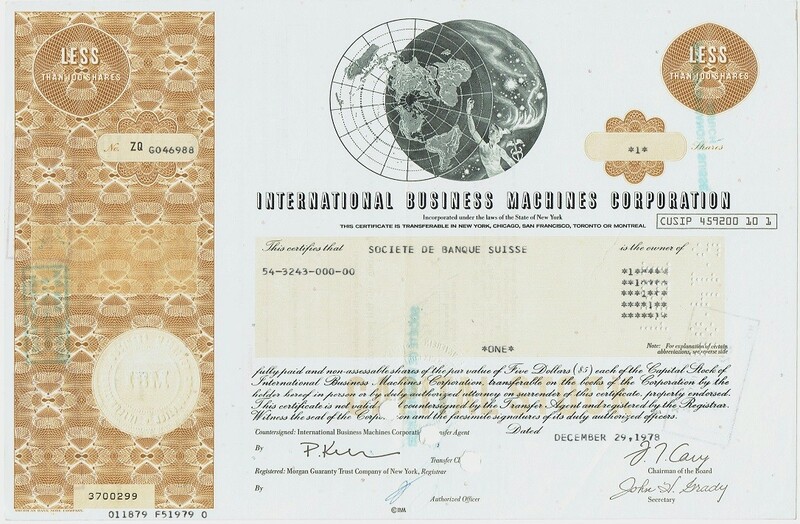 The new company logo formed by the letters "IBM" was introduced in 1947. 1961 The IBM 7030, also known as Stretch, was IBM's first transistorized supercomputer. 1964 IBM announces the IBM System/360 family of compatible computer systems. The chief architect of System/360 was Gene Amdahl. The different processor models would have identical instruction codes. By means of a standard interface, most processors would support most peripherals. Custom designed electronics packaging called Solid Logic Technology - half-inch ceramic modules containing circuitry denser, faster and more reliable than earlier transistors - allowed an increase in price/performance over existing computers. System/360 produced another competitive challenge to other manufacturers: the concept of a compatible range. It allowed customers to purchase a smaller system with the knowledge they would be able to migrate upward without any software reprogramming or replacing of peripheral devices. 1964 The IBM MT/ST (Magnetic Tape/Selectric Typewriter) was a built-in desk model of the IBM Selectric typewriter. Its magnetic tape recording and playback facilities were located in an attached enclosure with controls and a bank of relays. The MT/ST recorded text typed on magnetic tape and allowed editing and re-recording during playback. It was the first system marketed as a word processor. 1964 The company announces the IBM 2250 Graphics Display Unit as part of System/360. The 2250 used vector graphics. Any character set or font could be displayed. 1964 IBM introduced the 1800 Data Acquisition and Control System as "a computer that can monitor an assembly line, control a steel-making process or analyze the precise status of a missile during test firing." 1965 IBM launches its least expensive computer so far, the 16-bit IBM 1130 system. It can be rented for less than $1,000 a month and sells, with a disk drive included, at $41,000. 1965 The Gemini Guidance Computer was designed for Project Gemini, America's second man-in-space effort. 1965 The System/360 Model 67 was IBM's first system that supported time-sharing. 1965 The company launches Model 1130 a 16-bit desk-sized minicomputer. 1966 IBM ships its first System/4Pi avionics computer. More than 9000 units of the 4Pi systems are delivered by the 1980s for use in the air, sea, and space (F-15 Eagle fighter, AWACS, Harpoon Missile, NASA's Skylab and the Space Shuttle). 1969 IBM adopts a new marketing policy that charges separately for most systems engineering activities, future computer programs, and customer education courses. This "unbundling from the hardware" gives rise to a multi-billion-dollar software and services industry. 1969 The IBM System/3 is a low-cost system designed for small business. It is the first IBM system to use Monolithic System Technology (MST) logic circuits. 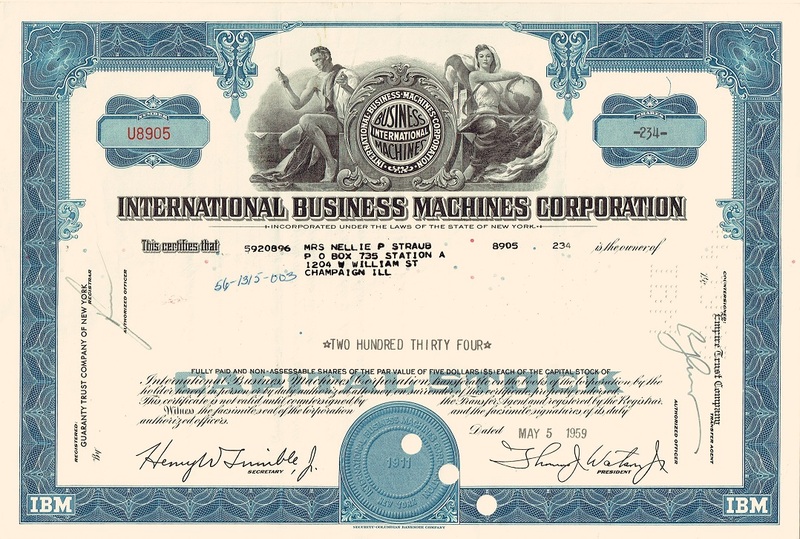 The IBM stock certificate shown here was issued for 696 shares of $5 on May 3 1966. A vignette of Mercury in space draws attention. Thomas John Watson Jr's facsimile signature is located in the lower right corner. This modern certificate breaks with the traditional design of borders printed along all sides. 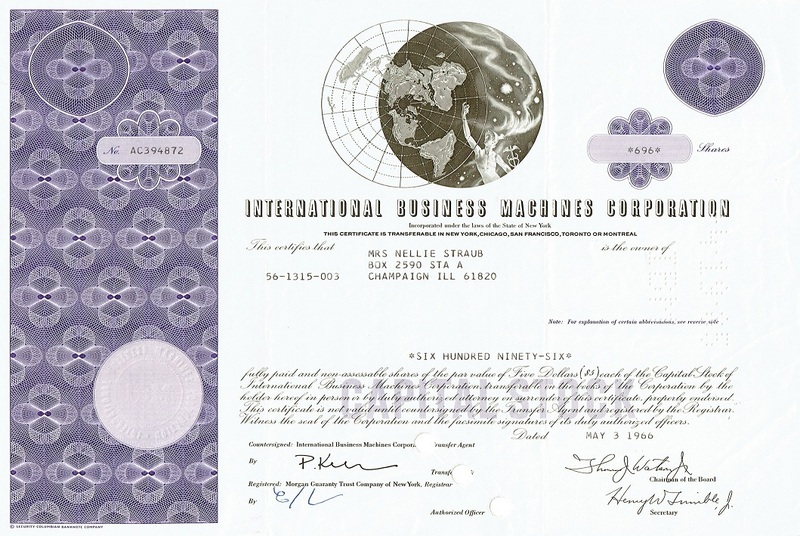 The share still has an IBM logo, however it is not visibly printed but embossed in the mauve circle. 1970 IBM launches the IBM System/7, its first minicomputer, a sensor-based system for process, manufacturing and laboratory applications where it collected and reacted to input from analog devices (e.g. temperature sensors). It was a 16-bit machine and one of the first made by IBM to use semiconductor memory. 1971 IBM announces its IBM 3735 Programmable Buffered Terminal. This data-entry station allowed to store data for later transmission to the mainframe computer. 1972 Starts developing the IBM AP-101 avionics computer that has been used in the U.S. Space Shuttle. The Space Shuttle used five AP-101 computers as general-purpose computers. Four operated in sync, for redundancy, while the fifth was a backup running software written independently. 1972 The IBM 2922 Programmable Terminal, a Remote Job Entry terminal, is introduced. It consisted of a Control Unit, a Printer and a Card Reader. The 2922 had no disk, however 8K of magnetic core memory preserved programs loaded from cards thru power on-off cycles. 1973 The IBM Los Gatos Scientific Center developed a portable computer prototype called SCAMP (Special Computer APL Machine Portable). SCAMP emulated an IBM 1130 minicomputer to run APL\1130 programs and was one of the first personal computers in the world. SCAMP used the the IBM PALM processor (Put All Logic in Microcode), a 16-bit central processing unit implemented on a circuit board. 1975 IBM introduces the IBM 5100, its first portable personal computer which offered Basic and APL programming and up to 64 Kbytes of main memory. 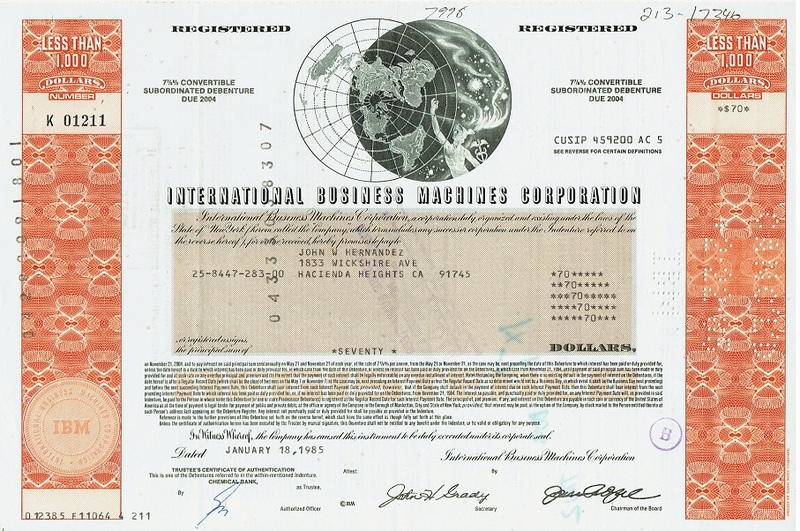 Incorporated was a typewriter keyboard, a numeric keypad, a display screen showing up to 16 lines of characters, and an exchangeable magnetic tape cartridge unit. The system was also based on the PALM CPU. This 1978 IBM certificate for "less than 100 shares" looks similar to the purple one shown above. 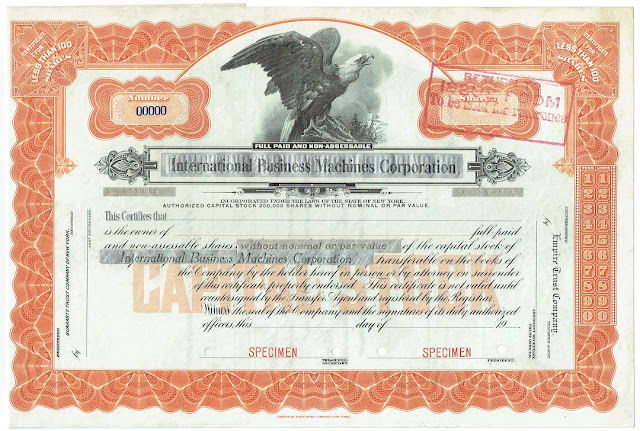 However, it is printed by the American Bank Note Company and contains a special anti-counterfeiting feature. The pale brown rectangle printed between the serial number and the circle - left side - contains a latent image. When the certificate is tilted and viewed against light falling at a shallow angle the word 'IBM' is revealed. 1981 IBM announces the System/23 Datamaster, Model 5322, IBM’s first true microcomputer, (all in one chip), based on Intel's 8-bit 8085 microprocessor. 1981 The IBM Personal Computer Model 5150, also known as the IBM PC, is introduced. The influence of the IBM PC on the personal computer market was substantial in standardizing a platform for personal computers. 1982 IBM announces its first industrial robotic systems. The 7565 and 7535 manufacturing systems are programmed with AML, an advanced commercially available robotic control language developed by IBM. 1983 IBM Germany produces the Bildschirmtext (BTX) terminal (videotex) for the Deutsche Post. 1983 IBM Personal Computer XT is a version of the IBM PC with a built-in hard drive. 1983 The PCjr home PC, read "PC junior", was IBM's attempt to enter the home computer market. The PCjr, model number 4860, was based on the IBM PC's 8088. Included was a joystick, a built-in RF modulator to send video and audio to a TV and an audio output jack to connect to a stereo or amplifier. The PCjr was manufactured for IBM by Teledyne, Inc.
1983 IBM purchases about 20 percent of Intel's outstanding stock in order to provide Intel sufficient capital to develop follow-on generations of the Intel 8088 chip. 1984 The company releases the IBM Portable Personal Computer 5155 model 68. The system featured standard 256 kilobytes of memory, a internal monochrome monitor, and one or two half-height 5¼" 360 kB floppy disk drives. 1984 IBM acquires ROLM Corporation for the latter's digital telephone switching technology . 1985 The IBM token-ring local area network permitted personal computer users to exchange information and share printers and files within a building. 1985 IBM introduces the IBM 3090 vector processing systems intended for running computation-intensive programs. 1986 IBM PC Convertible is the first laptop computer released by IBM. It was also the first IBM computer to use the 3.5" floppy disk. 1986 IBM introduces the RT Personal Computer line of workstations. The RT is the first workstation to use the Reduced Instruction Set Computer (RISC). 1987 Steve Chen quits Cray Research and starts Supercomputer System Inc., Eau Claire, Wisconsin, which the financial backing from IBM. 1988 IBM introduces the IBM Application System/400 (AS/400), a family of computers designed for small and intermediate-sized companies. As part of the introduction, IBM and partners worldwide announce more than 1,000 software packages. the magnetic stripe card, the relational database, and lots more. In 2012 alone, IBM researchers received more than 6,000 patents. 1990 IBM introduces the System/390 family consisting of 18 Enterprise System/9000 processors. 1990 IBM introduces the Personal System/1 (PS/1) . 1990 IBM announces the RISC System/6000, a family of nine workstations. 1991 Sega Corporation releases its TeraDrive 16-bit PC which is manufactured by IBM. 1992 IBM launches the ThinkPad series of notebook computers featuring a TrackPoint pointing device located in the middle of the keyboard. 1992 IBM's subsidiary, AMBRA Computer Corporation, launches its line of personal computers, servers and workstations. 1992 IBM develops Angler, a prototype device combining a mobile phone and PDA including features like a calendar, address book, notepad and other apps such as maps, stocks and news. 1993 IBM introduces the Scalable POWERparallel System based on smaller mass-produced processors able to break down complex queries into a series of smaller jobs that are run "in parallel". 1994 Both The Cornell Theory Center and CERN, the European Laboratory for Particle Physics, receive the world's fastest general purpose computer: an IBM Scalable POWERparallel Systems SP2, capable of performing 136 billion calculations per second. 1994 IBM develops the Simon Personal Communicator, the first smartphone in the world. This handheld touchscreen PDA, manufactured by Mitsubishi Electric Corporation, is branded and sold by BellSouth Cellular Corporation. Simon includes telephony features, sends and receives faxes and e-mails and features applications like an address book, calendar, calculator, notepad, and the like. The system can be upgraded to run third party applications either by inserting a PCMCIA card or by downloading an application to the phone's internal memory. 1996 IBM introduces its network computer - the IBM Network Station, a desktop device that provides access to networked applications and processing power. 1997 IBM's Deep Blue, a 32-node IBM RS/6000 SP supercomputer programmed to play chess, defeated World Chess Champion Garry Kasparov. Deep Blue was capable of calculating 200 million chess positions per second. 1997 IBM launches its Netfinity line of enterprise PC servers that support the Microsoft Windows NT computing environment. 1997 The IntelliStation line of Microsoft Windows NT-based workstations is introduced. 1998 Blue Pacific - the world's fastest computer is jointly developed with the U.S. Energy Department's Lawrence Livermore National Laboratory, Blue Pacific can perform 3.9 trillion calculations per second and has over 2.6 trillion bytes of memory. 1999 IBM acquires Sequent Computer Systems. 1999 A research project is started with the Lawrence Livermore National Laboratory, the United States Department of Energy, to build the Blue Gene supercomputer. 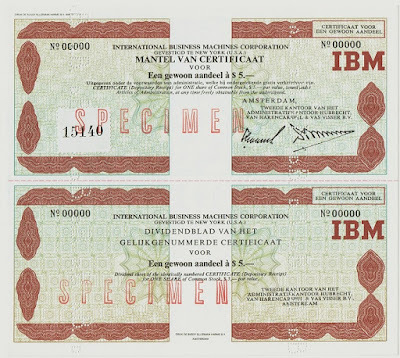 Trading of IBM shares on the Amsterdam stock exchange started on May 1 1959. 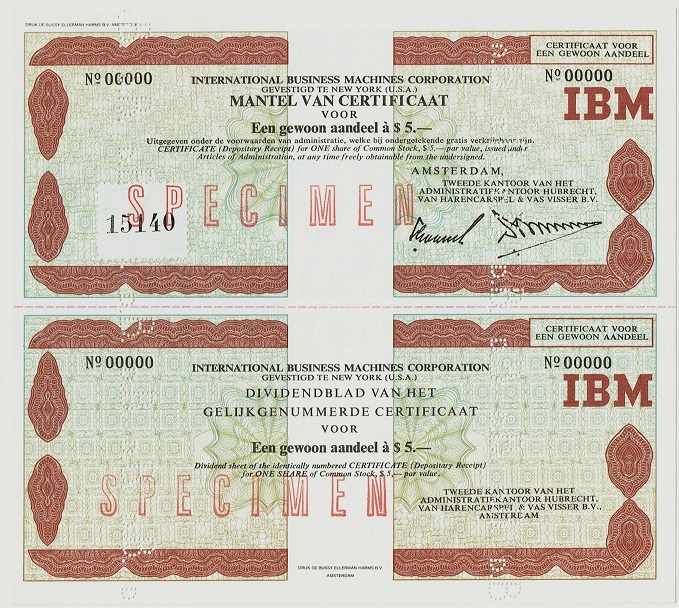 This specimen depositary receipt for 1 share of $5 was printed by De Bussy Ellerman Harms during the 1970s. Depositary receipts represent a foreign company's publicly traded securities on a local stock exchange. 2000 IBM works with Citizen Watch Co. to create the "WatchPad", a wristwatch PDA (wearable computer) that runs on Linux on a 32-bit ARM processor with 8MB of DRAM and 16MB of flash memory. The WatchPad has a speaker, a microphone, a monochrome LCD, a fingerprint recognition device and uses Bluetooth for PC connections. 2000 IBM delivers the ASCI White supercomputer to the US Department of Energy. It covers a space the size of two basketball courts and weighs 106 tons. 2000 The company introduces the IBM eServer series. 2002 IBM releases a series of systems based on Sequent Computer Systems NUMA architecture. 2008 IBM built the IBM Roadrunner for the Los Alamos National Laboratory: the first supercomputer in the world to operate at speeds faster than one quadrillion calculations per second. 2008 IBM introduces the water-chilled Power 575 supercomputer. 2011 The Blue Gene/Q supercomputer has a peak performance of 20 Petaflops.